Roving God of Fortune mascot as a flier distributor? Or a God of Fortune mascot to provide photo opportunity for your event? God of Fortune mascots also proved to be a hit with roadshows to generate leads as public love to take photos with God of Fortune mascot! Roving God of Fortune mascot(cai shen ye mascot) has always been a hit with businesses to draw customers attention and provide photo opportunity with clients and guests. 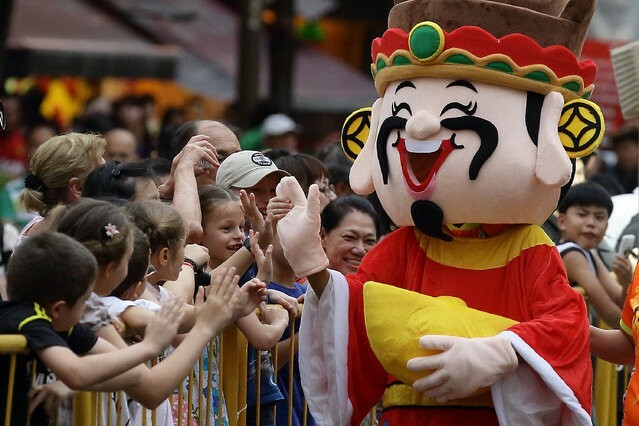 With the close association with prosperity and wealth, God of Fortune mascots are most suitable for any celebratory events. Also known as the God of Prosperity and the face of Chinese New Year, the God of Fortune mascot has always been a hit with adults and children alike during festive seasons. We also provide Dancing God of Fortune mascot performance for all events. This performance is a sure fire way to put a smile on your audience. This performance is popular for any Lunar New Year events and events catering to international delegates. All our dancing God of Fortune mascots are choreographed with all mascots limitations in mind, so you can expect a wonderful performance for your event. Roving act includes a talent and a mascot minder. Services include flyer distribution, photo opportunity. Talk to us if you have any other ideas of using our God of Fortune Mascot! We also provide gold chocolate coins for distribution to symbolize spreading of wealth. What functions will be best suited to engage God of Fortune Mascot? Events like opening ceremony, pre-Chinese New Year lunch/dinner, Chinese New Year celebrations usually engages a pair of lion dance with a God of Fortune mascot. Malls have also been engaging Roving God of Fortune mascots to engage shoppers and provide photo opportunity to shoppers. Why is Lion Dance always paired up with a God of Fortune Mascot? Lion Dance has always been seen in celebratory events, hence business owners always requested for both the lion dance and mascot to be present at the same time.